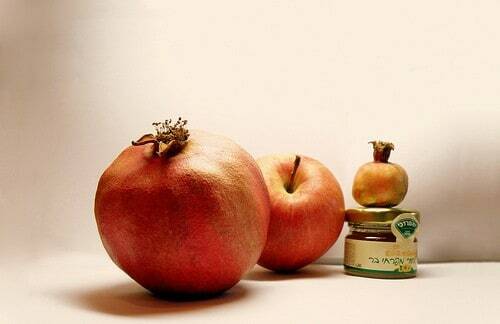 Rosh Hashanah is coming! Are you ready? There are a lot of things I’d rather be writing about today, but I can’t avoid the subject any longer. I’m talking about Rosh Hashanah, less than three weeks away beginning Wednesday evening, September 9. Not only is the two-day holiday followed immediately by Shabbat, making it a “three-day Yom Tov” even for those of us in Israel—it’s early and if the last few weeks are anything to go by, it’s likely to be exceedingly hot as well. Of course it rained last year, so one can hope. Having reached the limits of my refrigerator’s capacity for withstanding the heat just with regular Shabbat cooking at the height of the summer, I am wary. I can’t possibly see cooking food for Shabbat on Wednesday and having it last until Shabbat. And how could I cook it all on Wednesday even if I wanted to? Well I probably could, but it wouldn’t be wise. Bake and freeze challah and honeycake. Since I’m not a masochist, this will have to wait for the weather to cool off a little. But if I wait too long, the kids will be back in school and I won’t have as much help. Cook and freeze soup and meatballs. I avoid freezing because a) the food doesn’t keep as well afterward and b) it shouldn’t be refrozen as leftovers. But the soup gets finished easily, and the meatballs will have to as well. Foods cooked in sauce generally freeze better than say, roast chicken. Have fish for one or two meals. Fresh frozen fish defrosts overnight and cooks quickly, so I can pull it out of the freezer Thursday night and cook it for lunch on Friday, or for Friday night. My son, the one who dislikes fish, will be off guarding somewhere around Jerusalem so that gives my menu some more flexilibility. Make cholent on Friday. I keep the crockpot on a timer for the first two days (just for half an hour) then adjust it on Friday afternoon to stay on overnight. I’ll make cholent from ingredients that can be prepared in advance and the meat can be in the freezer until Thursday. Have a light dairy meal at some point. While this is refreshing, it doesn’t always make life easier in the long run because you are left with two sets of utensils. Prepare and marinate fresh fish or meat for quick cooking at the last minute. Use the crockpot creatively. I know someone who would serve meals for three days from the crockpot. Each successive meal was cooked more and more. I don’t know that my family would object, but I don’t find it appealing. What creative ideas can you suggest? We need input from the “chutznikim” for whom a 3-day yom tov is a regular occurrence. Note: My other site CookingManager.Com is intended for a general audience. I’ll be posting some Rosh Hashanah recipes but I don’t plan to go into halacha (Jewish law) over there. What Hostess Gift Do You Like? My friend and I are planning to share a “leftovers” meal for Shabbat lunch. We will both bring our leftovers to the table, the meal will be casual (although my husband hates using paper goods on Shabbat or Yom Tov, so there will be dishes to wash). If there aren’t enough leftovers (which is unlikely), we’ll make salads and have cold cuts. The idea is for it to be a “little-to-no-prep” meal. Good idea. My husband also objects to paper, but all week long too. We will do what we usually do for RH: Fish for one dinner and lunch (and a baked noodle-cottage cheese dish for the kids), and quiche for the other dinner and lunch. For Shabbat, we’ll have falafel. I buy the falafel balls ahead of time and they keep fine in the fridge. Then I warm them up for Shabbat. They warm quickly, and people are happy for a more “casual” and less “challah-oriented” meal. Sometimes when I’m making quiche for RH, I make double and freeze some for Succot (when we have a similar menu). Fish for Yom Tov and quiche for Shabbat Chol HaMoed. Or the other way around. Maybe we’ll have lasagna for Simchat Torah. I make apple pie for RH and Succot, and I do like to make them in advance and freeze them. They freeze very well. My biggest problem for three-day Yom Tov is limited freezer space, so I can’t cook ahead as much as I’d like. I always serve a fish meal and may serve two this time. It depends on whether or not we’ll be invited out. I also like to cook and freeze. Kugels and meatloafs are good, chicke, too. I haven’t really started to think about it yet, but we will almost certainly be having fleishigs for every meal. We don’t have milchigs for the first 2 Shabbos meals, my husband says that simchas yomtov means red meat during the day, I couldn’t bring myself to serve milchigs for the 1st night, so that only leaves the 2nd night as a possible milky option. I usually do poultry in the evening and meat at lunchtime. I tend to cook as last minute as possible to avoid having to freeze too much, but as in chutz la’aretz this is just the first of 3 3day yomim tovim, this will probably change over the next few weeks. I tend to freeze side dishes and cakes rather than main courses or soups. Also i’ll make a couple of “one pot” main dishes, with meat and vegetables, so that i can cook eg couscous on the day and make a salad rather than kugel and 2 vegetables. We make a big thing out of the simanim in the evenings and have that as the starter – fishballs, squash kugel and lots of salads. We are hosting sheva brochas this week so I spent some time yesterday making lasagna – 2 plain cheese, 2 spinach cheese, 2 parve tofu spinach mushroom. I’m sure we won’t use it all for the sheva brochas (its motsi shabbos), and the rest I will save for tishrei – either for before or after the fast, or cholhamoed etc. Yomtov and shabbos aren’t my issue – I can always whip something together, its in between that is my problem – everyone is home from school and I’m sick of even looking at food. I agree with the soup and meatballs from the freezer, but in addition I make kreplach for erev YK and all of sukkot/ST. My kids also like “chicken balls” in the soup. We have a CSA share so that tends to inform my menu and I never know what I’m getting until the night before. I do have a tremendous amount of eggplant and am looking for suggestions on what I can do with it and freeze other than eggplant parm. And our minhag is no garlic in tishrei so no hatzilim either. Any suggestions? am, I know what you mean about the days in between. Although leftovers usually kick in, I don’t mind simple meals during those weeks. My crock pot came with three different sized bowls, so I plan to do two different crockpot dishes, maybe soup for Thursday and/or Friday and then replace that bowl with a different one for cholent on shabbos. I have not done this before, so we will see if we will repeat it for Sukkot. My Thursday night meal will definitely be a simple leftover meal. I have been making sesame noodles with cut up chicken breasts that I make on the stove just cooking in teriyaki sauce. I find the noodles feed a lot of people and both the noodles and chicken can be served cold, so it has been a good summer meal. shana tova! hi Stacey, I have never heard of a crockpot like that. It sound perfect for Yom tov. Of course one could always buy a second bowl. OK, I’m about to have a baby any day soon (!) and I’m so desperate about RH that I’m kind of hoping to last until RH, have a baby then and spend the holiday at the hospital. Wouldn’t that be convenient? :o)) But of course one can’t count on that. So, assuming we’ll have a new baby by RH. We’re married under 3 years. For the past 2 years, we were invited to spend RH with family. But this time I don’t find such prospects appealing because I remember how I craved privacy, privacy and more privacy, and being *at home* after the birth of my first daughter. I checked out all your tips and they are helpful, but I have no idea how much time we really have left. So I’m cooking some meals for the freezer now but my freezer space is limited. I hope to survive somehow… and perhaps this is the one time we can indulge in ordering ready meals. Side note: with our first baby, we received the thoughtful gift of meals from all our neighbors, but I don’t want to count on that. Anna, I imagine the neighbors will still bring you food–people cook so much anyway. I will buy my Challot – for the Yom Tov & for Shabbat, I will bake an apple cake & a honey cake on the 8th in the morning. I then bake a filet of salmon & put it in the refrigerator. (I also boil eggs & steam green beans & place them in the fridge as well.) I will have started my brisket on the 7th, As my fish & cakes are baking, I slice my brisket & get it ready to finish cooking for the first night’s meal. I boil potatoes & carrots to serve with the brisket – actually enough for leftovers. For the second night’s dinner, I put 2 chickens in the crock-pot – sprinkle with salt & pepper & drizzle with honey. I bake a parve tsimmes to serve with the chicken. Shabbat dinner is a “Nicoise” salad. I serve cold salmon with cold green beans, hard boiled eggs & the left over boiled potatoes. Everything that is not prepared as meat is parve & all lunches are leftovers – usually cold. A-H: You sound very organized and experienced. Mrs. A: You’ll just have to spread the word. aidelmaidel – I broil eggplant and add only a drop of salt to it and we think it’s delish. The real challenge is the second night meal when you can’t do any prep til the first day is over. So if we are talking fleishigs it must be something with a sauce that will heat quickly. I’m thinking of going with scrambled eggs with lox for that meal. True, it does add milchigs to the mess, but we use paper for milchigs so it’s not too bad. RA, you can always make it pareve if you have the right pot, and serve it on fleshig plates. I’ve done that to accommodate my chicken-loving son on the second night, serving the fish as a first course, then chicken soup, then putting out chicken if anyone was still interested. Nice idea LoZbut at our stage and circumstances, we are the ones doing the inviting. I find dishes with liquid like stuffed cabbage, meatballs, and stewed chicken freeze much better than dry dishes, so go right ahead and freeze them. I freeze them in aluminum pans so they can go straight in the oven to heat up. Tesyaa, the problem with aluminum is that the acid in the tomatoes can eat through it. Each year, I try to get things done ahead of time and then my procrastination monster rears its ugly head. I think, however, that I started my planning early enough this year, that I’ve outlasted my procrastination and will be able to start cooking and freezing this week. Right now, I’m focusing on getting the kugels (broccoli, carrot & zucchini, potato) baked and frozen. I’d also like to make some cookie dough and freeze that as well. What has your experience been with freezing challah? Do you freeze the dough or bake the bread and then freeze? I bake and then freeze the challah, wrapping it carefully and keeping it wrapped when defrosting too. This stops the crust from getting moist from condensation. You can freeze just-shaped loaves and let them defrost and rise for 4-7 hours, depending on the temperature of your kitchen. This takes up less freezer space and gives you just-baked challah. Tesyaa- stewed chicken sounds good and as you say, freezable. Care to share the recipe? Chanan – I don’t really have a “recipe” but it’s along the lines of chicken paprikash without the sour cream. (We once had a wonderful Hungarian babysitter who helped me with this one). I saute a couple of sliced onions and a couple of sliced red peppers until soft, add a tablespoon or more of paprika, several cups of broth or water, and a cut up chicken. You can remove the skin if you like, and you can brown the chicken separately first (but I don’t bother). Cook for 45 minutes on a slow boil. But there are lots of stewed chicken recipes like coq au vin – as long as you’re using liquid and ending up with a saucy consistency it should freeze well. Thanks, Tesya. I have a recipe for “Basque RAbbit” that sounds very similar. I see the quotations so I’m assuming that you are using a rabbit recipe for chicken. I haven’t been on this website before, but I doubt you are eating a non-kosher animal such as rabbit. Sorry – I just was looking around for yom tov menu ideas and stumbled into this blog. Yes, the recipe was for chicken. No rabbit on this website. Thank you for this awesome post. (Once again.) I remain in RH denial; I have no choice, but I am going to print these tips and put them in my kitchen! Stacey, your idea for the noodles is a great one too, which I think I am going to try. I find for 3 day holidays I like to make a big pot of ratatouille. It goes with almost anything, and my husband is willing to eat it over and over. So I know I have something for his pasta/couscous/rice. And it is hard to get wrong. ima2seven, thank you! I also like to stick to mainly staples and add only a few special items. I’m curious if folks have ideas for me – I suffer from chronic migraines and have seen an increase of late. While nitrates and sulfites were always triggers, I used to be able to get away with an occasional salad dressing with balsamic vinegar. No more. I’ve found anything remotely fermented – vinegar, wine, soy suace/tamari/shoyu, etc will trigger a migraine even in small amounts. (Bye bye sushi). AM, I second what Jendeis said. Use lemon juice on everything, if that agrees with you. Orange juice works too in many recipes. I’m sorry your diet will be so restricted this year. @ aidelmaidel: What about mixing lemon juice with some olive oil as an alternative to the vinegar? I find that we get tired of repeated “Stuff-Stuff With Heavy”, as Calvin Trillin calls it. Far from not having enough food, we nearly always feel it gets to be too much eating. Lots of vegetable salads, and one light meal for every heavy one, which may mean milchiks, or even sandwiches with baguettes. I realize that this is high houswifely heresy, but my family really prefers it this way. Nurse Yachne: No such thing as housewifely heresy, at least not on this site. Salad Nicois (sp?) sounds wonderful, as does cold salmon, especially in the heat we’ve had lately. We also like greek salad with feta and black olives as a main meal, possibly with a hot or cold soup. And fruit salad is always appreciated and worth the effort hereabouts; anything to assist in digestion of those holiday meals. We also make a bunch of cookies and have fruit on hand for our teenagers and their constant stream of guests. As my kids grow older, their preferences regarding food and meals hold more sway than in the past. If sandwiches on baguettes or a bagel bar are what they consider a big treat, we try to accommodate that for Shabbat and holidays. I like when they feel comfortable inviting their friends and our home becomes a pivot for teen meetings. It’s even worth the piles of sunflower seed shells at various locations the morning after. Sounds good, Elianah. Good luck! First two meals – chicken and beef; Thursday evening – cold salmon fillet. Friday night – chcken again. Shabbat which I make on Friday. Timer which switches the gas off after you finish cooking on Yomtov. And whatever we do, we always end up with too much food.